History and Significance: This large residential house across from the Augusta Country Club is screened from those passing on Milledge Road by overgrown shrubbery. 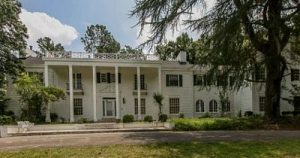 Built in 1927 for Mr. and Mrs. Benjamin Franklin Jones, III, of Pittsburgh, Pennsylvania, this winter residence in Augusta was nearly an exact copy of the owners’ primary residence in the north. The architect of their Pennsylvania residence was Brandon Smith and the house is an good example of the Colonial Revival style. An Augusta Chronicle article from January 30, 1927 reports that the Joneses were again wintering at the Bon Air-Vanderbuilt Hotel “pending the completion and opening of the handsome new villa on Milledge Road”. That article boasts that “the home is about completed and will be one of the show places of Augusta when it is finished’. The Joneses are also reported to have included an electrical elevator, electrical refrigerating system, exhaust fan for the kitchen, and electrically equipped laundry in their winter home. The garden plan was designed by Pitkin and Mott Landscape Design and was featured in the Garden Club of America publication focusing on Augusta and Aiken in 1932. The home passed into the hands of local families, but recently has been offered for sale after the passing of the last owner. Future plans remain uncertain for the Summerville landmark. Threat: Property is located on the fringe of the Summerville National Register Historic District, making it susceptible to potential insensitive development pressures. Preservation Tools: (1) A contributing resource in the Summerville Historic District, which is listed on the National Register of Historic Places, and is therefore eligible for all programs of the National Register which are tax incentives for certified rehabilitations and other potential grant funds when available; (2) located in the Summerville Local Historic District which means that any alteration to the exterior, including demolition, should be approved by the Augusta Richmond County Historic Preservation Commission.